75583CSN is rated 3.1 out of 5 by 11. Rated 2 out of 5 by Maggie from Great until button jammed I bought this less than 9 months ago and it was working great. Tonight the button stuck in the off position and now cannot use the handheld. Really don't want to buy another shower head as we loved the features on this one. Any ideas on fixing? Rated 5 out of 5 by j007klein from GREAT UNIT Once we got used to the reduced water pressure, we've come to love this shower head unit... especially the various spray patterns! 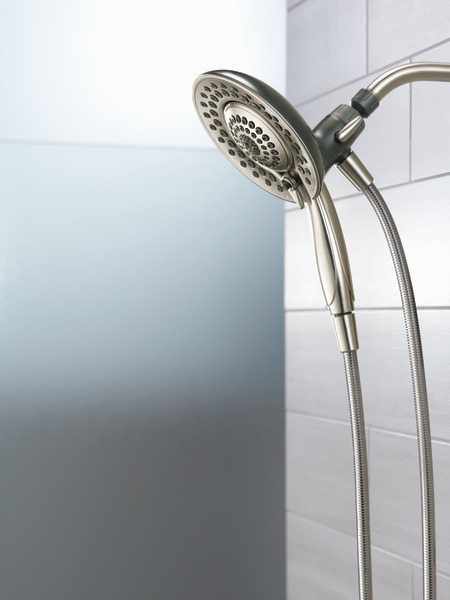 Rated 2 out of 5 by Lyda from Liked until broken We chose this model for its versatility, and change the water flow type out of the handheld with every shower. Like other reviewers, the switch broke right off. We are hoping it is covered under the warranty, but not sure. Would hate to spend money on a new one. 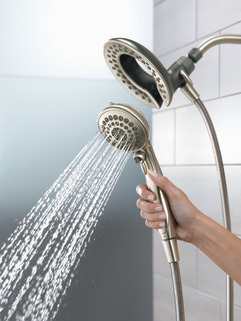 Also, the bronze color started coming off of the shower head and hose almost immediately. Rated 3 out of 5 by Garv from Great until... Product was great, easy to remove hand piece, easy to clean calcium build up, lots of different flow options then the lever on the hand piece broke. Now it is stuck on on one type of flow and unable to be changed. If it is going to be made of plastic it should be easier to move back and forth otherwise should have been made out of metal. Rated 2 out of 5 by Noah from doesn't last As others have said, this showerhead was great until the lever snapped off. For the price paid it should be made out of metal, not cheap plastic. Very disappointing. 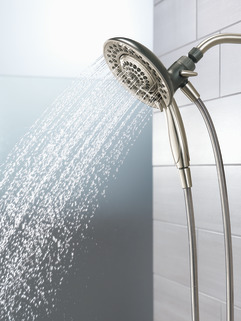 Rated 4 out of 5 by Balanced Enviro from good, but The shower head as it came from the box was very weak . After I removed the water saver restriction it is now very good although some time may be too powerful. A more balanced water saver design would make the product perfect. Purchased the 75583CSN handheld unit for our master bath shower and the first thing we noticed is the reduced water pressure. One reviewer, Balanced Enviro, mentioned he was able to remove the water restrictor to regain water pressure. How do I do this?? 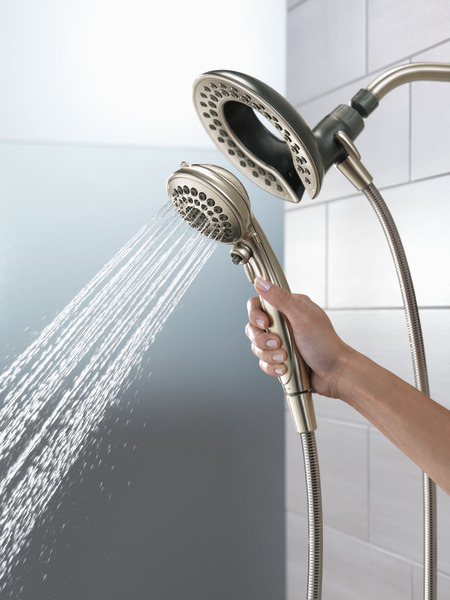 I would like to use the intuition in a small corner shower but I am concerned about the projection of the shower head always hitting the opposite wall. Is the intuition head adjustable, such that it can be pointed sharply downward? Can you get a longer hose for it? 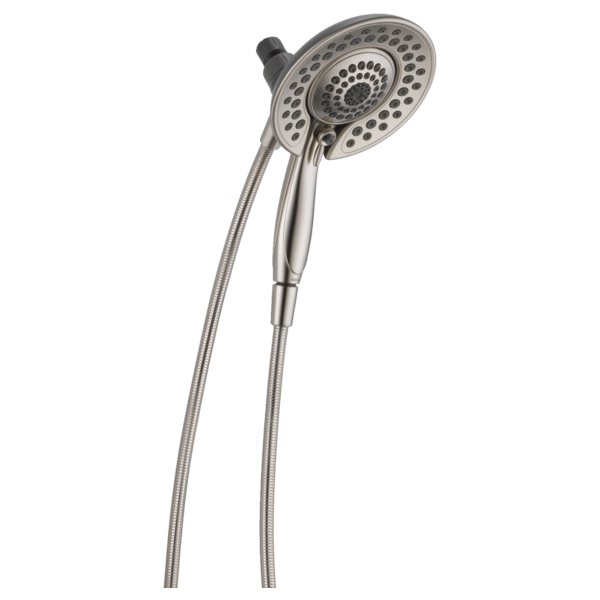 Our shower head pipe is very high and we need a longer hose than what it comes with (72&quot;)? Is there a longer hose in the Venetian Bronze? For some reason the water isn't very hot and I am wondering if there is a setting that causes this to happen. When I pressed the pause button, it remained stuck. How can I fix that, because water just trickles out of the handset.